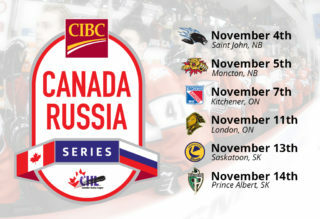 For the first time since 2014, the CHL enters Game 6 of the CIBC Canada Russia Series on the ropes. Following back-to-back victories, Russia carries a 9-6 series lead in points into tonight’s contest in Drummondville as Team QMJHL is tasked with winning in regulation before facing a shootout for the second straight year, one they’d have to win to claim series supremacy. The host Voltigeurs, the 10th ranked team in the CHL this week, will give the home fans plenty to cheer about with five player in the lineup as head coach Steve Hartley serves as a Team QMJHL assistant alongside Jim Hulton (Charlottetown Islanders) behind the bench. Drummondville’s CHL record-tying fourth CIBC Canada Russia Series clash will also feature a Voltigeur suiting up for the opposition as Nashville Predators prospect Pavel Koltygin, who had two assists in Sherbrooke on Tuesday, will look to put Russia over the top for its first series win since 2014. Beaudin’s roommate Joseph Veleno echoed those sentiments, sharing his enjoyment of the Drummondville community since being acquired by the Voltigeurs in December 2017. Team captain Nicolas Guay, New Jersey Devils prospect Xavier Bernard and tonight’s starting goaltender, Edmonton Oilers prospect Olivier Rodrigue, join Beaudin and Veleno in the Team QMJHL lineup under Hartley, who is in his first season as head coach in Drummondville. Joseph Veleno selected 30th overall by @DetroitRedWings in 2018 #NHLDraft secured two 1st round picks from #CHL’s @Voltigeurs_DRU for the first time since 1988. Beaudin and Veleno shared a special moment this past summer in Dallas, being selected just a few slots away from each other by a pair of original six rivals in the first round of the 2018 NHL Draft. Beaudin went 27th overall to the Chicago Blackhawks while Veleno went 30th to the Detroit Red Wings, giving the Voltigeurs two first round picks in the same draft for the first time since 1988. The two returned to Drummondville where the Voltigeurs are off to a 14-5-1-0 start to the season, outscoring opponents 87-56. Veleno (11-12–23) is in a three-way tie for the club scoring lead with Guay (10-13–23) and Gregor MacLeod (10-13–23) as each has 23 points on the campaign. Beaudin has missed some time due to injury, but has 12 points (2-10–12) through 11 games. Tonight the two standouts look to lead the way to a QMJHL victory with what will need to be a much improved performance from Tuesday’s 5-1 loss in Sherbrooke. “I think they were quicker than us the other night,” said Beaudin. “We gave them too much space. We made some adjustments at practice today and we just have to play quicker. You don’t have time to handle the puck for two or three seconds, you have to move it right away. Catch tonight’s CIBC Canada Russia Series finale live on Sportsnet and TVA Sports when the puck drops at 7 ET/4 PT. The game can also be seen streaming live at CHLLIVE.com.